On occasion, it is necessary to dunk your chicken in a water bath. 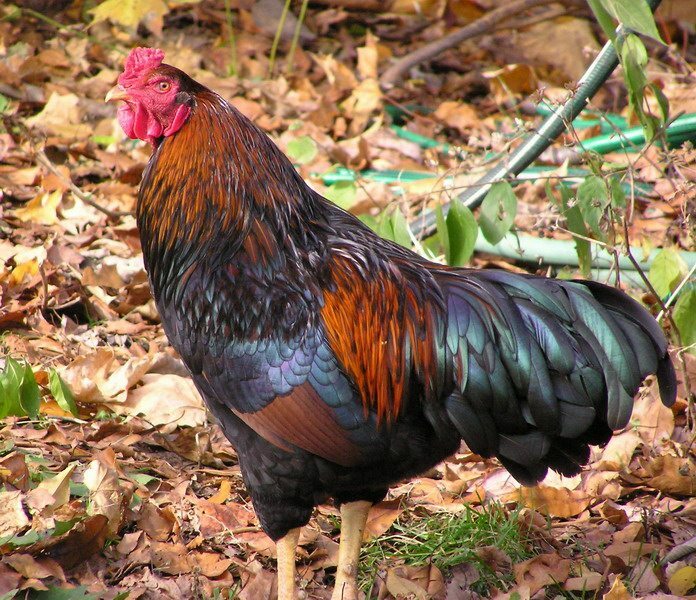 Though the traditional chicken dust bath keeps them somewhat clean and pest free, a good washing will do an even better job of working dirt off feathers, mud off feet, and parasites away. 1. Check the weather. If it’s cold out you won’t want to wash your birds. Chickens can be quite prone to colds and respiratory problems so you’ll want a warm, sunny day where they can get out, be fluffed in a towel, and then let out to sun dry. 2. Prepare the washing center. Washing chickens in a three barrel affair. You will want to get three tubs that are a little wider than the chickens and deep enough that you can submerge the body of the chicken, but not their head. In tub number one pour a gentle liquid hand soap, then add water so it’s nice and bubbly. Warm or lukewarm water made it a nice experience for the chicken as it’s not quite the shocking temperature cold water is. In the second barrel have just plain water, lukewarm or warm. This is your rinsing bucket. In tub three put in a mixture of vinegar and water; two cups vinegar to each gallon of water. This is where you’ll really bring out the shine of the feathers. 3. Start with the dirtiest chicken first. Grab them up and head over to the buckets. Be sure you’ve got them securely held. 4. Start with tub number one. Dunk the chicken, leaving their head above water. You want to be sure you have a firm grip on them, try to keep their wings under your hands. Lift them in and out of the water a few times, but don’t scrub; scrubbing can break feathers and ruin plumage. Once they’re soaked all the way to the skin, hold them up over the water, let them drain and have an assistant (if you have one) give their feet a scrubbing over with a cloth. Double check the vent area. 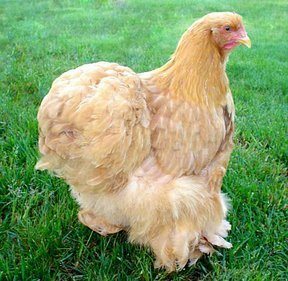 If this is matted or has poo, you may need to soak that area and gently scrub in the direction of the feathers. REMEMBER! 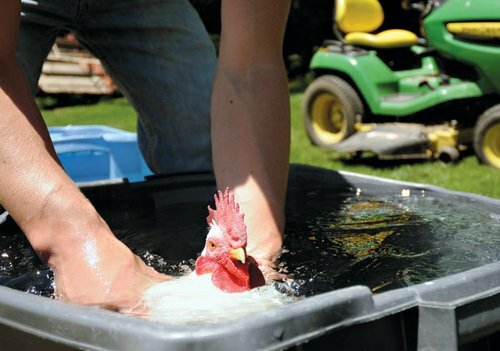 Always keep the chicken’s head above water and NEVER leave your chicken unattended. They cannot swim. 5. Move them over to tub two and gently move them in and out of the water to get all the soap out. Make sure that you get all the soap off; watch the water as it drains off the chicken. Are there any bubbles still coming off? If so, keep rinsing. 6. Give the chicken one or two dunks in the vinegar water solution. This is just to give their feathers an extra beautiful shine that you’ll both love! 7. Dry your chicken. Hold them over the last tub till they drain. Wrap a towel around them, leaving their head free and hold them. Don’t rub, rubbing breaks the feathers, but pat them very gently around the body and under the wings. If it is cold, you’ll need to blow dry them with the lowest setting on your dryer. If it’s warm they can air dry. 8. Trim beaks and nails if necessary. 9. Dust your birds with lice and flea powder if you have a mite, lice or flea problem. 10. Use this chance to send someone in to clean the coop. Get everything from the flooring to the coops to the nesting boxes all changed out so your nice clean chicken remains nice and clean!